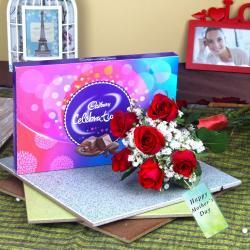 Product Consist : 10 Red Roses Bouquet, 12 Inch Teddy Bear along with Cadbury Celebration Chocolate Pack (Weight : 118 gms). 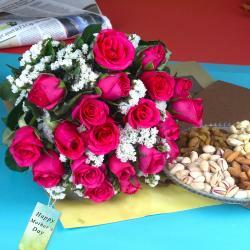 Give your dear mom a reason to smile by pampering her with extraordinary gifts of Giftacrossindia.com on her special occasion like Mother's Day. A child is always special to a mother no matter whether the child is young or obedient or troublesome. She loves them the way they are, she always hopes for the best. 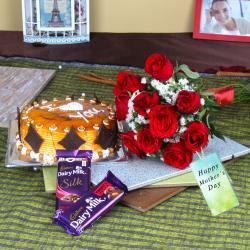 This is the simplest yet a very passionate hamper including Fresh Red color Roses bouquet and Cute Teddy bear along with delicious treat of Cadbury Celebration Chocolate Pack to tell your darling mom how much you love her. Browse your favorite products it is very conveniently available for online shopping from anywhere in India with Same Day Delivery option. So go on and place your order now to show her how much she is important to you. 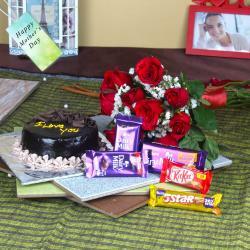 Product Includes: 10 Red Roses Bouquet, 12 Inch Teddy Bear along with Cadbury Celebration Chocolate Pack (Weight: 118 gm).